Now you can give clients indisputable proof that your officers are on the job with GuardMetrics security officer tracking software. 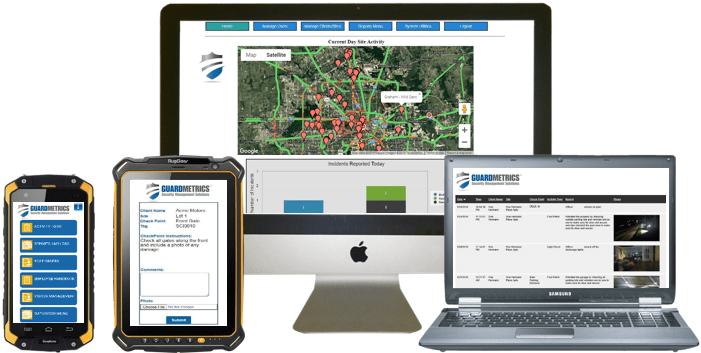 GuardMetrics officer accountability solution shows you exactly where your guards are – in real time by way of GPS photos – and creates reports to prove it. And GuardMetrics even gives you the ability to give your client a limited-access “Client Portal”, so they can look all the real-time and stored data whenever they wish; alleviating the need to even send reports! To top it off, the GuardMetrics security officer tracking software–for both guard tour/ patrol and incident reporting–is an incredibly easy guard tracking app to learn and deploy. Call GuardMetrics, or click here, to gain the competitive edge with this real-time security officer tracking software app! Security guard companies lose clients because stakeholders aren’t convinced the officers are doing their jobs, and yes, as we all know, sometimes that’s true. Employee performance is a huge concern in every industry. But when you can show prospective customers that you have a true security officer tracking system for officer accountability, your company gains the competitive advantage and WINS new accounts! GuardMetrics’ mobile security guard tracking software lets you see, minute by minute, what’s going on in each shift at every client site. And because your guards are kept accountable, you can take the action needed to boost productivity, and give your clients the excellent results they seek from their security guard service provider of choice. Call GuardMetrics for security officer tracking software to help you win new clients and keep the ones you have! With our GPS geo-tagging feature, you will know when and where any event or incident occurs. You can also see if the QR codes, RFID or NFC tags at checkpoints are missed or essential jobs are not carried out properly. The information captured in the reports is automatically uploaded in our cloud-based dashboard for administrators to access from any location, and act on accordingly. Administrators can review guard tour and patrol tracking data, incident reports and group or individual performance to confirm officer accountability. And your clients can be given access to real-time patrol updates and/ or receive branded incident reports and activity logs via the “Client Portal”. Your conscientious staff will welcome the opportunity to show you how well they’re performing, while those who need additional training can be given specific guidelines and the help they need to become great employees for you and your customers. Just as importantly–and the key to client retention–your clients will be assured that your staff is delivering exceptional service, as promised. Real-time monitoring for real accountability – Your clients will love this security officer tracking software! GuardMetrics software tracking app opens up the line of communication at all levels and automates otherwise hectic administrative work. It makes security officer tracking transparent and actionable: a plus for your security staff, your stakeholders, and your business. Call GuardMetrics today at (800) 825-6858 for more information about how we can help you grow with affordable, easy-to-deploy security officer tracking software! Click here to request a free demo on any GuardMetrics solution, including but not limited to; Guard Tour Systems, Incident Reporting, Visitor Management, Post Order Management and much more!